As teams start to drop out of contention in the group stage and the World Cup championship picture begins to take shape, the competition for the coveted Golden Boot — the tournament’s top individual honor — is also getting interesting. And there may be no player making a stronger case than France’s Karim Benzema, a Muslim forward who plays professionally for Real Madrid in Spain’s La Liga. Benzema has three goals in France’s first two matches, both dominant victories against Group E opponents Honduras and Switzerland. He is tied with four other players as the World Cup’s top goal-scorer, and his two assists ties Benzema with several others for third place. France looks like arguably the best team in the world right now, and Benzema is currently their best player. Not only is Benzema shining in the first World Cup of his career, but the 26-year-old is also doing it while shouldering a heavier load than anyone expected going into the tournament. Days before France took the pitch for its group stage opener in Brazil, veteran forward Franck Ribery (also a practicing Muslim), a three-time French Player of the Year and 2013 UEFA European Player of the Year, was ruled out of the World Cup with a back injury. 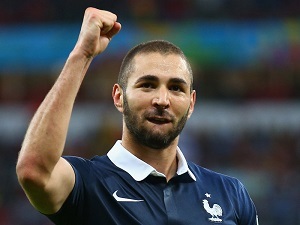 That left Benzema holding the crown as France’s top goal-scoring threat; and as the top target of opposing defenses. “Karim has confirmed he is in very, very big form at this World Cup,” France coach Didier Deschamps was quoted by UK’s The Telegraph. “It is evident that he has a joie de vivre at this tournament, which makes you happy to see. It is believed no Muslim player has ever won the World Cup Golden Boot, which was first awarded in 1930.